Sacrifice isn’t new to epic superhero movies. The modus operandi of most heroes is to lay down their life for their friends. It’s what they do. So when a movie like Avengers: Infinity War features 5011 leading heroes, it makes sense that the theme of sacrifice is turned all the way up to eleven. No less than five moments of sacrifice appear in the film, but interestingly, they are characters forced to sacrifice someone else, rather than someone jumping in front of the proverbial bullet. And so we have the Trolley Problem, an ethics thought experiment which I learned about on NBC’s The Good Place. In the problem, a trolley is barrelling down the tracks because its breaks failed, headed towards five people working on the tracks. By pulling a lever, you can save those five people, but on the other track is one person. Do you pull the lever and kill a person? Or do you stay the course and kill five? As explained in the clip, sometimes the experiment is heightened where there are jobs attached to the people — a doctor vs five sick children and so on. The choice becomes about whose lives you consider to have more value, and as with many ethical quandaries, there are few “100% right” answers and many debates. Several characters in Infinity War are presented with the trolley problem. Kill one person to save many, or kill many trying to save one person they truly care about. (This article could also be called “Three Times Gamora Was Victim to the Trolley Problem and Two Times She Wasn’t.”) Not all the heroes choose the seemingly more magnanimous and utilitarian option, however. Here is how it breaks down. The first time we encounter a choice between choosing the many over the few is with Peter and Gamora. After the Guardians of the Galaxy meet Pirate Angel orphan god Thor, the realization that this is it truly hits Gamora. Being Thanos’ daughter, she knows she has the power (read: knowledge) to stop Thanos from collecting all the Infinity Stones. So she asks Peter Quill to be the ruthless trolley conductor and run her over in order to save the people on the other train track (aka the Whole Universe). And Peter chose wisely. He chose to shoot Gamora, despite his recently confessed love for her. Despite Gamora forcing Peter to choose the many over the one she loves, Gamora was unable to make that same decision herself. She chose to save Nebula from Thanos’ torture over the lives of the entire galaxy. On Thanos’ ship, Nebula has been held captive and literally torn apart by some sort of magnetic torture chamber. 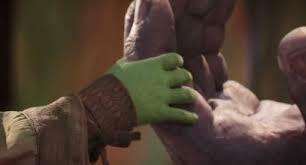 In order to stop her sister from being harmed any further, Gamora gives up the location of the Soul Stone, to Thanos, leading to both her doom and that of the larger universe. Despite her screams, Nebula clearly says don’t do it, but I suppose since Nebula didn’t make Gamora promise to kill her (as Gamora did Peter), Gamora’s resolve wavered. The MCU did a great job, however, of leading up to Gamora making this choice — her position as Thanos’ favorite “daughter” and the rift it causes in her relationship with Nebula has eaten at Gamora for both Guardians movies. And so Gamora’s choice to switch tracks and save Nebula from the trolley leads to her own death. It becomes like a math problem: If Gamora’s trolley switches tracks at 50 miles per hour, but the track she switches to has a bigger, purple train barrelling toward her in the opposite direction, how fast does it take Gamora’s little trolley to go kersplat? The answer? Not long. So Thanos "saves" half universe by killing Gamora and the other half of the universe. Imagine Gamora's trolley and half of every galaxy on a trolley as a brain-wrinkling exercise. While Thanos being a murderous, gem-greedy Barney doppelgänger is the main conflict in Infinity War, one of the Avengers causes the most anger among fans for her decision to save one toaster over a galaxy full of many other non-robotic sentient beings. Wanda’s (and technically also Cap’s) decision to go the mat to save Vision — valued member of the team, I get it — has caused many veins of frustration to throb among MCU fans. Vision’s humanity (or lack there of) aside, had the Avengers acted faster, Shuri may have had more time to figure out how to remove his dependence on the Mind Stone. Perhaps had the group known Thanos was out there searching for the shiny yellow gem in Vision’s head sooner, they could have had more options. But really, Wanda could have done what Starlord did much sooner: made the sacrifice for the greater good. She eventually makes the choice, but only once Thanos had everything he needed (a.k.a. The Time Stone). But seeing what Peter Quill did on Titan… she and Starlord can share the bench together. Finally, Doctor Strange also experiences the Trolley Problem experiment. Well, 14 million trolley problems. And in each problem minus one, they lose crushed by Thanos' large purple megatrain. So we’re left to assume that Stephen’s choice to give up the Time Stone and save Tony was in service to that one lone win. TV Tropes (one of my favorite websites) talks about the Batman Gambit, in which victims of the gambit fall into a trap by doing what they would normally do. In an example from the MCU: Loki getting caught by the Avengers in the first Avengers movie was a Batman Gambit. He just let their dysfunction as a newly formed team work to his advantage. In Thanos’ case, his normal behaviors are defeating the Avengers, getting all the Infinity Stones and snapping half the universe away. Someway, somehow, this is a subtle trap that will lead to his destruction. And only the poofed Strange knows how. But Strange’s Batman Gambit meant sacrificing the Avengers (including himself) and half the galaxy for whatever confluence of events leads to Thanos’ inevitable defeat. This was a very basic breakdown of both the trolley problem and Avengers: Infinity War. I'll admit to not having the range for more complicated ethics and philosophy, hence getting my main example from an NBC sitcom. If you have a greater understanding of these concepts, hit me up in the comments or on Twitter (@ConStar24) to explain how I got the Trolley Problem wrong (blame Chidi/Mike Schur) or to discuss other deep ethical quandaries Avengers: Infinity War dredged up, I'd love to know! If you’d like to read more about how Infinity War mirrors The Good Place, our pals over at The Nerds of Color have an awesome breakdown.